I am Yoko Sasaki, teaching English to local people at the foot of Tokyo Sky Tree in the state of construction, the central attraction of the world. I was always interested in introduing Japanese culture to foreign people and have been looking for what and how. Fortunately I happened to see a craftman who draws a picture or Chinese Charactors on a paper lantern. When I mentioned my dream, he just ageed to help me. The craftman and I have had meetings to search a way to introduce the culture over a year. Meanwhile a Sushi cheff agreed to help us, too. 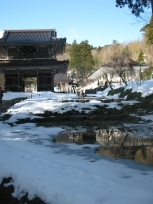 Here we can offer an opportunity to experience Japanese culture at a reasonable price of \5,500 for 2 courses. 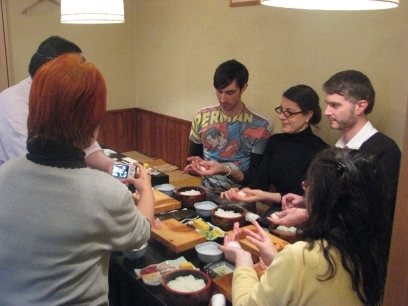 Making sushi: 4 nigiris, 1 gunkan, 2 hosomaki-rolls + miso soup + a performance of Sushi cheff making a Futomaki-roll. You can eat them all there. Drawing your name in Chinese Characters on a paper lantern with special ink and brush: the craftman is also an expert of Chinese Characters and therefore can translate your name into the ones of good omen. The size of lantern is 26 cms x dia. 7 cms, plane white. After the experience you can take it home. Perfect for interior?? ＊We prepare Japanese home-made cooking and Japanese Sake for the ones who want to share the fun time together　afterward. I am thinking of other ways to introduce Japanese culture at a reasonable price that I hope we can realise to offer in the near future. I hope you can make an unforgettable memories while staying here and feel closer to Japan and its people through these experiences. We can share the fun time afterward with Japanese home-made cooking and Japanese Sake. 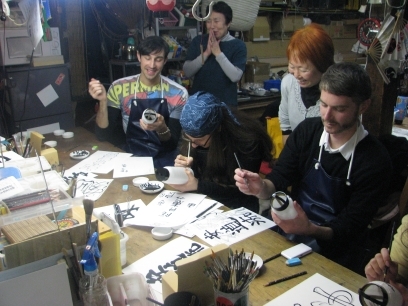 You can make an unforgetable memories by sharing the fun time with ordinary Japanese people. when to meet: 4:30 p.m. Exactly where to experience: Fukuwa sushi and Sogei-kan are only 10 minutes walk from Kinshicho Station. Sushi is available for vegitalians. Web Site: https://www.eikaiwa-tokyo.com E-mail: art@eikaiwa-tokyo.com © 2002-2006 Toru Matsuura All Rights Reserved. TOEIC is a registered trademark of Educational Testing Service(ETS). 英検 is a registered trademark of Educational Testing Service(ETS).